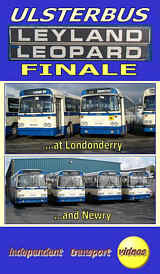 Our cameras have paid a couple of visits to Northern Ireland this year to record the farewell events at Londonderry and Newry, organised by our friends in the Irish Transport Trust, in association with local Ulsterbus staff. Derry was our first port of call, back on 28 January, when six Leopards, including a former Clydeside example from the Londonderry and Lough Swilly fleet, were used on a tour of routes in the Derry, Strabane and Limavady areas. Bridges featured a lot on this tour and we captured superb scenes at Tullyard (between Donemana and Newbuildings), Burntollet and a beautiful, late evening sequence of the vehicles crossing the Foyle Bridge on their way back to Pennyburn garage. This tour also raised c£300 for a local hospice. itv's second visit to the Province was for the farewell event at Newry depot. With the kind co-operation of Ulsterbus, the unique Wright TT-bodied Leopard No 258, new in 1982, was made available to transport the party from and to Belfast. Our driver on this part of the tour was Raymond Bell, who had driven No 258 on its first revenue-earning run and was now driving it on its last! From Newry, the tour took us through the beautiful scenery of South Armagh via Forkhill to Newtownhamilton, then on to the mill village of Bessbrook and back to Newry. Later, a visit was made to Rathfriland depot, high in the Mourne Mountains, fortunately before the weather turned. Ulsterbus Leopard Finale features both interior and exterior shots, run pasts and superb scenery, all with that familiar Leyland 680 roar that you get from a Leopard. There are two hours of a superb memory of a type not experienced in such numbers (with one company) by mainland enthusiasts, 681 being bought new with a further 110 acquired second-hand. itv would like to take this opportunity to thank the Irish Transport Trust, Ulsterbus and the Londonderry and Lough Swilly Railway Company, and their staff, for the kindness and generous assistance given in the making of this video.